We're working to build a herd of quality animals with amazing fiber, excellent conformation and well-known names in their backgrounds. We expect to have herdsires available for breedings by the Spring of 2007. Standing straight and tall is Arrow. He'll be a big, strong-boned boy like his daddy, Accolade, and his granddaddy Augusto. 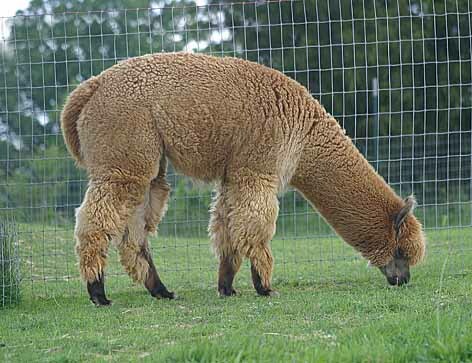 Superb fiber with good bundling and soft handle on a colored animal. Great fiber from the sire's family. Great conformation from both mom and dad. 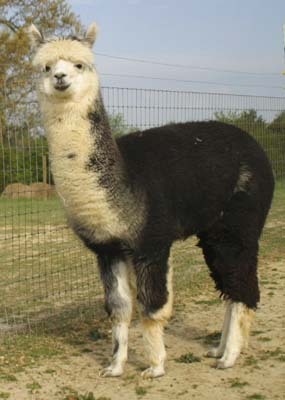 Plus a wide span of color genetic possibilities from his dam's side including the potential for greys and blacks. 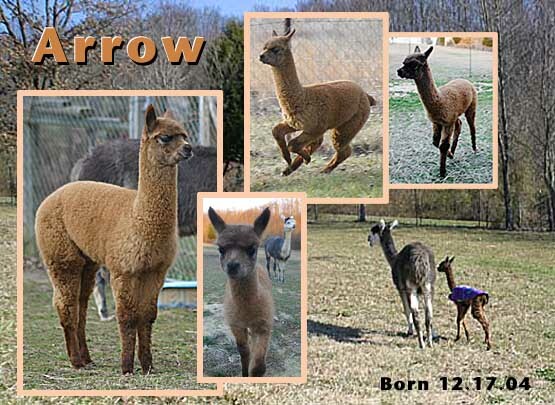 He's dark fawn in body color, contrasted with a darker face, lower legs and tail, that together create a striking combination that seems to give him extra speed as he zooms around the pasture. Catch him if you can. Please call or email and we'll be glad to arrange a visit so you can see this boy close up. He's really something. 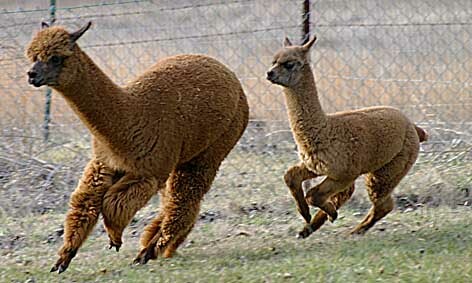 Arrow, at right, already loves to chase the girls. Jump ahead one year. 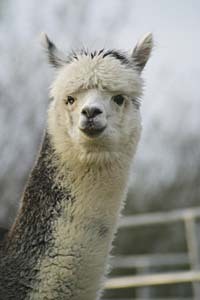 Arrow in full fleece, May, 2006. 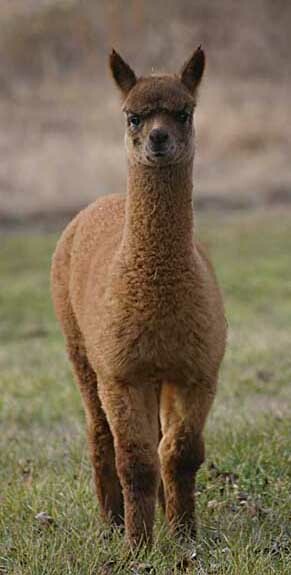 By now the judges have noticed his dense fleece and superb conformation. Arrow is now ready for breeding. Our newest baby arrival: Say hello to Quest. 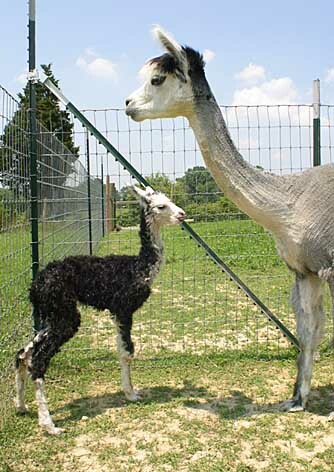 His momma is Snowmass Lady Guinevere and his daddy is Snowmass Noble Night, and thus his full name is "Quest of the Noble Night". Quest was born on Tuesday, May 29, 2006. 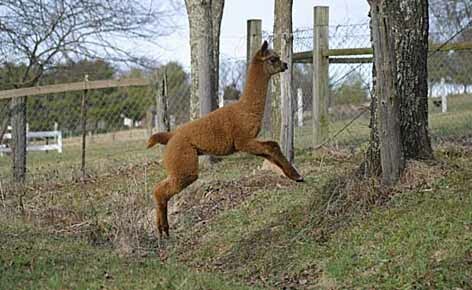 This is him running off to the far corner of the birthing pasture at the ripe old age of 45 minutes, followed by an anxiously humming mommy, Lady Guinevere. Here is Quest after he dried off a little. (Two and a half hours old). Superb conformation, with the straightest legs we've ever seen on a little one, and a nice flat back-line, he stands tall and proud from the get-go. 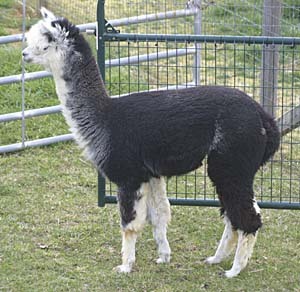 Great fleece, luscious soft, with a full blanket of true black (great for one-color shearing) and a striking mix of white and grey exploding all over the rest of him. We think he's special. Proud to have him in the herd. Coming from royal parentage of the highest esteem (his dam is Snowmass Lady Guinevere and his sire is Snowmass Noble Night), seeking knightly adventures almost from the moment of his birth, and all the while carrying himself with lordly bearing and a pure heart, he has thus been dubbed with the full name of . . . ta,daaaa . 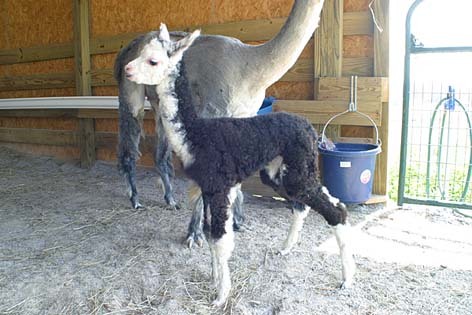 . .
"Quest of the Noble Night"
Come on out and visit little Questie, one of our herdsires of the future. Better hurry, 'cause he won't stay cute and cuddly forever, seein' how bad he wants to be a big tough adventurous herdsire. It's now 2008 and Quest is ready. Click here to return to the top of this page: Herdsires.